Secureaplus on Windows 10 is constantly flagging files in the C:\windows\Winsxs directory detected by the Emsisoft Engine. if you ignore them, the next day more will appear. I've had this happen on my windows 10 computer upstairs and on 2 Windows 10 laptops I just scanned. I included a screen shot. Thank you for reporting this. We have fixed it. I had to turn off Emsisoft here is another one it just started picking up on my computers. Can you send the file to secureaplus@secureage.com? 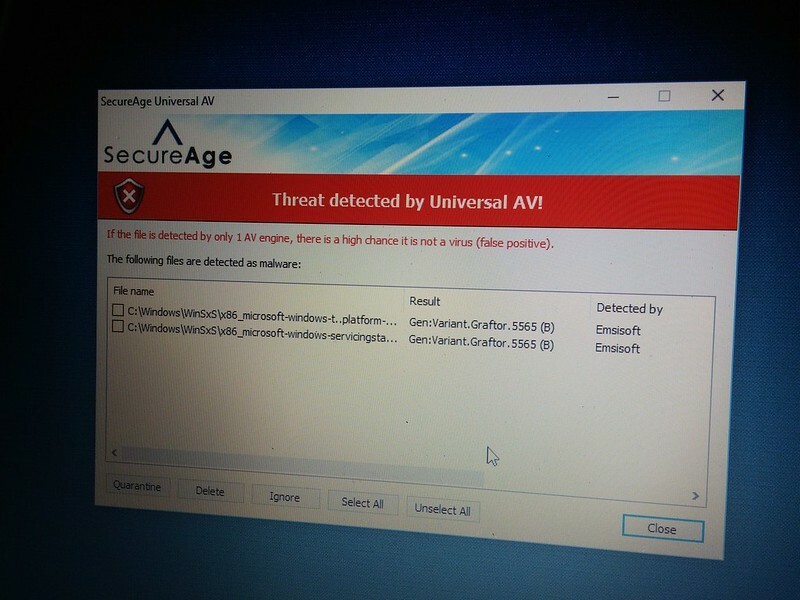 I'm uploading a screen shot again, I have 3 computers just updated to win10 only SAP [Emsisoft] is tagging this folder, I use Bitdefender as my AV and Norton on the other system they show these files as clean. Only Emsisoft keeps tagging files in this folder. upload to virus total and Emsisoft on there shows file clean? Thanks David for the file. We have received the file and fixed the issue.